Today, hundreds of millions of caps are wadded with oenoseal® liners worldwide. The know-how of oenoseal® has been recognised for more than 40 years by the entire screw-cap industry. As such, oenoseal® liners take a major part in wine development worldwide. La Manufacture Générale de Joints, based near Lyon in the heart of the Beaujolais winemaking region, has been developing and manufacturing one-piece and two-piece seals for more than 60 years, for applications in cosmetics, pharmaceutical, food and chemical industries, and for wines and spirits. From R&D to manufacturing processes (plastic processing, assembly techniques and punching and slitting operations), MGJ is fully committed to developing innovative solutions to meet consumers' expectations. For more than 40 years by your side, to develop the screw caps for wine market. This cap has no Redraw and requires a very compressible barrier seal of which surface is flexible enough to be able to avoid a too fast oxydation. A complex on a base Cork + Tin and PVDC is created. Launched on the Tin PVDC Facing base assembled on a foamed PE (Polexan) whose characheristics have been traced on the compression level / resilience of the Cork (250/300 kg/m3) and 2.0 mm. Development of versions more permeable than the tin allowing wines with a reductive tendency to age better with the screw cap: the Oenoseal S was born! Oceania adopts massively the screw cap, encouraged by the British Large-scale distribution. 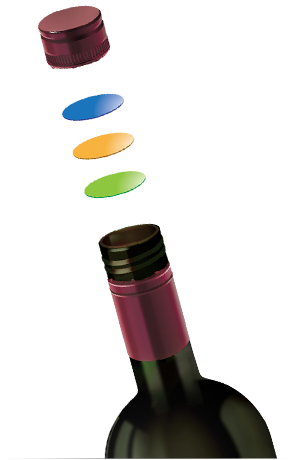 The screw cap continues its strong growth in Australia, New Zealand, South Africa, but also in Europe. The volume of 3 Billion screw caps is reached which represents 1 bottle of wine on 6 sold in the world! The volumes have risen above 5 billion screw caps, representing 1 wine bottle on 4, at the world level. The MGJ know-how is recognized by all the screw caps manufacturers and the Oenoseal market share exceeds 70%. GUALA CLOSURES & MGJ LAUNCH "WINE DEVELOPERS"
Guala Closures and MGJ join their expertises to develop and launch a new range of OENOSEAL for wine nano-oxygenation including 3 levels of permeability : Onyx, Ivory, Coral. In addition, , a software for decision making, is displayed on line on the Internet website, allowing wine producers to select the most suitable liner for the wine which will be embottled. œnoseal® - Not just a seal, but a system! Œnoseal® is a range of liners especially designed for the wine market. The liner is a multi-layer product located at the bottom of the cap, each layer providing a different barrier level. In direct contact with the liquid, the organoleptically neutral œnoseal® liner is an essential alternative to traditional corks. Not only because liners do not develop TCA, the molecule responsible for contaminating wine and giving "tainted" wine, but also because, with equal ageing and preservation performances, the lined cap is cheaper than a cork. As an example, no corked bottle has never been found among the millions of bottles of Riesling and white Sauvignon in Australia and New Zealand which were sealed since decades with oenoseal® liners; yet, these wines are especially prone to corking. Note: the percentage for corked white and red wines infected with TCA varies between 4 and 7%. Of course, taste is capital. The challenge for our liners is not only to provide improved technical functions, but also to respect and preserve the work and passion of wine producers. Our aim is to preserve the very essence of a wine, what typifies an individual wine and what ensures its excellence: freshness and flavour. For this, we offer a range of liners that will meet your requirements for perfection. 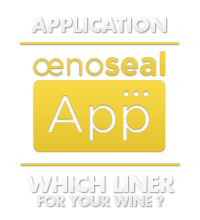 Oenoseal® liners are particularly suitable for all kind of ageing wines since they respect their integrity without any variation in time. Allowing a wine to age means to consider its living dimension. The perfect seal provided by our liners preserves the volume of air that is essential and specific to each wine. Œnoseal® guarantees leading edge technical solutions regardless of the type of closure used and irrespective of the qualities of your wine. It is also backed up by a large experience since MGJ has been developing and mastering assembly and die cutting techniques for over 40 years! The diameters of our liners are suitable for any kind of screwcaps: metal, plastic or crown , for still wines, sparkling wines and champagne. The new range Oxygen Management, developed in partnership with Guala Closures Group for their Wine Developers proposal (www.winedevelopers.com), is a genuine innovation towards a controlled wine oxygenation through cap sealing. This range of 3 liners allows the wine producer to chose the most suitable liner to the OTR level ( Oxygen Transfer Rate), to the kind of wine to be packed, according to the characteristics of the wine, the intentions of the winemaker and the consumer's expectation. For the first time, the liner is printed under the brand oenoseal® ONYX, IVORY or CORAL. This is a landmark and real guarantee of authenticity for the winemaker and the consumer. This new range is dedicated to all kind of wines (red, white, rosé) whatever the wine making method, the presumed turnover and the range level (Popular Premium, Premium and Top Premium). The different permeabilities of liners, constant in time and therefore predictable, allow a nano-oxygenation of wine after bottling and offer a customized sealing. is a software for decision making made available for wine producers with the aim to select the most suitable liner for the wine to be bottled. What are the advantages of the œnoseal® concept? This is an experimented and tested range of liners: no bottle of wine that has been using œnoseal® liners for several decades has been known to be corked. The quality-price ratio with regards to corking is very attractive compared with traditional corks. What experience does MGJ/œnoseal® have in this field? More than 60 years of experience with one-piece and two-piece liners for many applications: food, cosmetics, pharmaceuticals, chemicals, wines and spirits. What quality of preservation does œnoseal® liner offer? Total quality, both for still wines and for sparkling wines. The absence of cork taste, the optimal protection of the aromas, the organoleptic neutralilty and the nano-oxygenation by constant contribution of oxygen, constitute important guarantees for the wine producer. Can œnoseal® liners prevent a wine from being corked? Yes. Firstly because there is no cork and secondly because œnoseal® is made of organoleptically neutral materials that do not develop the TCA molecule which causes contamination resulting in corking. Can I store my bottles flat? Because œnoseal® is made of organoleptically neutral materials, your bottles can be stored and transported in upright, flat or upside down position. What guarantees does the Oenoseal liners offer about food contact ? All the liners manufactured by MGJ are conform to the FDA and EU regulations. The manufacturing process of MGJ guarantees the organoleptic neutrality of the liners and the entire conformity with the regulations in force: absence of heavy metals, no glue or solvent, absence of Bisphenol A, no phtalates. How much is 6 - 2 ? The campaign "Aluminium Closures - Turn 360" was launched by the leading European manufacturers of aluminum caps and screw caps from EAFA Association (European Aluminium Foil Association). Members of EAFA represent over 80% of the world production of aluminum caps for wine. Screwcap sealing for still wines: extract n°6 from bottling guide. For this area of Languedoc, known and recognized for the high quality of its wines, the screw cap allows to better preserve the organoleptic qualities of the wine but also to move with the times! South World Wines is a company of import and distribution in France of wines coming from the southern hemisphere. For her, the screw cap is a real progress for the quality of all wines. This beautiful Alsatian property with worldwide known wines uses the screw cap since the 2004 vintage on the range "Tradition" and some wines in the range "Terroir Wines". The wines bottled in this way are mostly fruity wines and are consumed within 4 to 5 years. We are very lucky at the Domaine Laroche and in Chablis in general, to have great terroirs that are perfectly suitable for Chardonnay.